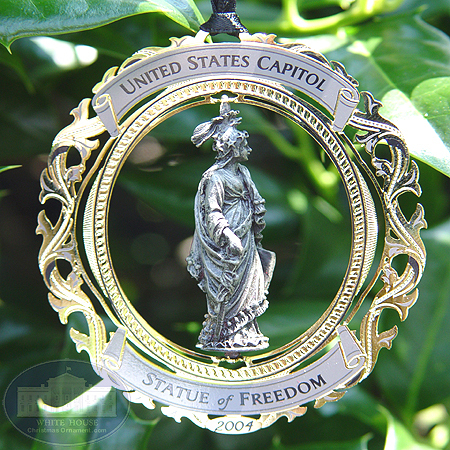 The White House Ornament Collection presents the 2004 Statue of Freedom Ornament. The U. S. Capitol Historical Society's newest edition to it's annual metal series is this 2004 collector�s edition 3-D spinning ornament. Featured in the center is a replica of the magnificent bronze "Statue of Freedom" by Thomas Crawford that crowns the edifice of democracy, the United States Capitol. Beautifully gift boxed, this item contains a provenance gift enclosure. All ornaments are insured and delivered to your home by the United Parcel Service. UPS is committed to doing "absolutely, positively" whatever it takes to deliver the ornaments to you.